(L/R) Jennifer Hoskins, field representative, Sen. Roy Blunt (R-MO); Otis Williams, executive director, St. Louis Development Corp.; 7th Ward Alderman Jack Coatar; Susan Witcher, president/CEO, Faultless; Mark Spence, COO, Faultless; Dan Mehan, president, Missouri Chamber of Commerce; and Don Musick, owner, Musick Construction Co., Brentwood, MO. Faultless Laundry Co. formally opened its new 83,000-square-foot laundry during a ribbon-cutting ceremony on Oct. 30. 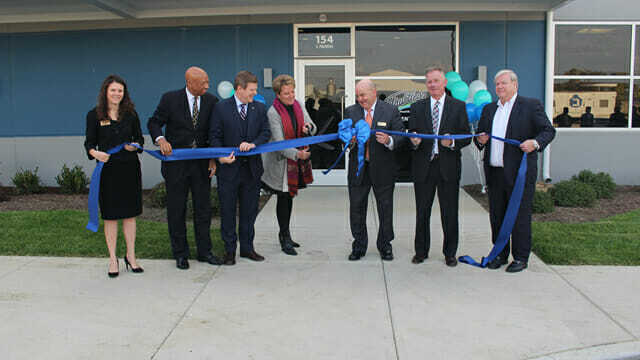 The event drew 30-plus civic and company officials, vendor representatives, friends and family members to the new plant at 154 S. Trudeau St., on the southern edge of downtown St. Louis. The plant, which began operating in July, represents a tale of civic teamwork on the part of both the company and local officials that’s now paying dividends for a city that’s faced its share of urban challenges in recent years. In essence, Faultless’ new plant replaced one that opened in 2012 a few miles north at 1615 N. 25th St. Unfortunately, this property was part of a 97-acre site that the federal government wanted to build a new Western headquarters for the National Geospatial-Intelligence Agency (NGA). This organization serves as a combat support agency for the U.S. military and the U.S. intelligence community. Its mission is to collect, analyze and distribute geospatial intelligence in support of U.S. security interests. The stakes? Roughly 3,100 federal jobs with an average salary of $98,000 per year, according to Otis Williams, executive director of the St. Louis Development Corp. (SDLC), a not-for-profit organization that seeks to boost jobs and investment in St. Louis. “Needless to say, we had to negotiate,” said Williams, a retired U.S. Army colonel, who spoke during the ceremony in a tent pitched in front of the new blue-and-white Faultless building. “We made it through that, so we ended up with this fine facility that is behind us.” Williams thanked Faultless for working cooperatively with city and federal officials to help secure the NGA deal. Faultless’ efforts enhanced those of local officials to keep the agency in the “Gateway City to the West,” rather than having it relocate its headquarters across the Mississippi River to Illinois, or other locations. “We could not have done it without the cooperation of the Faultless team,” Williams said, noting that city officials now expect to turn the parcel over to the federal government by the end of this year, including the land where the former Faultless plant was located. That site was surrendered through an “eminent domain” action. The government compensated Faultless for its loss through a negotiated settlement. Figures were not disclosed. Spence returned the compliments, noting that Kansas City-based Faultless opened its first plant in St. Louis in 2001. Since then, the city of St. Louis has provided an excellent environment for Faultless to grow its healthcare linen business. Along the way, however, the company has faced challenges. Foremost among these was the Loy Lange Box Co. boiler explosion on April 3, 2017. That incident claimed the lives of three Faultless employees when a large pipe burst through the roof of a nearby cardboard factory. It flew 600 feet through the air. When it landed, the pipe pierced the roof of the offices of a second Faultless plant located at 2030 S. Broadway. This plant is about a five-minute drive from the newly opened Faultless plant on Trudeau Street. The new Faultless plant is worth recognizing as well. During a tour of the new facility, we saw two distinct plants in one building. One 40,000-square-foot section is dedicated to acute-care linens and garments for hospitals. A second 23,000-square-foot section is dedicated to outpatient clinics, surgicenters and doctor’s offices – most of which are connected to Faultless’ hospital clients. Another 25,000 square feet is taken up by a mechanical/boiler room, offices and storage space, including a second-floor mezzanine area. Witcher says the new plant is in the process of certifying to both TRSA’s Hygienically Clean Healthcare and the Healthcare Laundry Accreditation Council’s standards. The Broadway plant is already certified. Certifying the Trudeau Street plant as well will help ensure the safety of the textiles that Faultless provides to patients and healthcare professionals. The new plant employs 110 people on one shift, six days per week. It’s currently processing 55,000 lbs. a week in the outpatient area and 210,000 lbs. per week in the acute area. A custom engineered air-handling system, designed for up to 10 air changes per hour, in conjunction with a Building Automation System platform, for full control of plant utility consumption. A cart washer from Automation Dynamics with an “instant kill” chemical wash to ensure that no microorganisms survive the cleaning process once the cart leaves the chamber. Three 900 lb. washer/extractors from Ellis Corp.
12 mod, 242 lb. Kannegiesser ETECH tunnel washer with 8 Kannegiesser ETECH 250 lb. dryers. A chemical injection system featuring peracetic acid bleach from Gurtler Industries Inc.
Watch for follow-up coverage in Textile Services magazine.